Doug Donaldson was all set to rely on his playing experiences from an athletic childhood when he agreed to coach his son’s youth basketball team. But when the first day of practice arrived and the group of second-graders looked up to their new coach, he was just as confused as the kids. How was he possibly going to give them the best coaching and instruction? PlaySportsTV, the website that Donaldson created in 2006 as a result of that experience and which is now the leading on-line youth sports coaching and instructional resource in the US, has launched a newly redesigned website, making it easier for youth coaches and parents to teach young athletes. To coincide with the launch of its new website, PlaySportsTV is introducing a variety of web-based training plans for many of its sports. New training plans released by PlaySportsTV include Coaching Youth Baseball for T-ball through Little League, featuring Princeton Univ. baseball coach Scott Bradley; Slide Like a Pro for Little League baseball players; Coaching Girls Softball; Coaching Youth Soccer for kids aged five through eight; How to Play Striker for more advanced soccer players; and Coaching Youth Lacrosse. CBSSports.com, in partnership with CBS Sports, CBS College Sports Network and the NCAA will provide a live online broadcast of the Men’s Final Four semifinal and championship games of the 2009 NCAA Division I Men’s Basketball Championship via NCAA March Madness on Demand. It will be just the second time ever that a major U.S. sporting event has been shown live and in its entirety on the Internet. The 2009 Men’s Final Four features the University of Connecticut, Michigan State University, the University of North Carolina and Villanova University. The official web sites for all four schools participating in the Men’s Final Four are managed and produced by CBS College Sports. 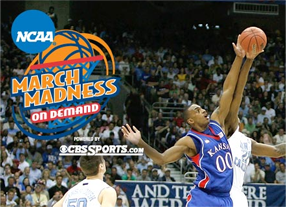 NCAA March Madness on Demand can be viewed through a standard video player and a High-Quality option, both offered free of charge. The Sports Network and Contec Innovations announced the upcoming availability of their new global mobile sports service in early 2009. The new global mobile sports service provides unprecedented mobile access to all things sports. Covering more than 50 sports and hundreds of leagues and events from around the world, this initiative allows mobile users around anywhere to access up-to-date news, photos, results, statistics, live action and more. Available via mobile Internet, SMS and MMS, the service has three distinctive audiences in mind at present: mobile operators seeking to enhance their sports offering, mobile service providers that wish to add new services to their portfolios and media companies/brands that sponsor mobile Sports content in their local markets or on a global basis. Major League Baseball Properties has licensed Commodore Gaming the rights to produce personal computers and PC cases decorated with artwork and themes associated with all MLB teams. Now customers of Commodore Gaming and Major League Baseball fans can own top-notch personal computers that represent their passion for their favorite ball team. From the Windows desktop theme to the exterior of the PC a MLB Series Commodore Gaming computer is decorated with the team artwork. The companyâ€™s exclusive â€œC-kinâ€ high-definition paint process is designed to produce visually-stunning PC exteriors. Commodore C-kins are not stickers or vinyl layers, but chassis panels permanently decorated to a finish much like an automotive paint job. High-definition artwork is baked on metal case at 350 degrees Fahrenheit then covered with a durable anti-scratch layer for protection and shine. The result is beautiful and extremely durable. MLB.com has launched its exclusive offseason subscription package with the live streaming of the championship game from Major League Baseball’s prestigious prospect development league, the Arizona Fall League, on November 22 at 2:30 p.m. EST. The offseason package, which is available now at MLB.TV,, is highlighted by nearly 50 hours of exclusive coverage from the annual Baseball Winter Meetings, which begin on December 8 and will culminate with MLB.com’s live pick-by-pick streaming of the Rule 5 Draft on December 11. Shane Victorino of the World Series Champion Phillies, 2008 Home Run Derby champion Josh Hamilton and two-time Cy Young Award winner Johan Santana are among the players chosen in past Rule 5 Drafts. On-Demand Video and Audio – Re-live the many milestone performances, great games and dramatic finishes from the regular and postseason in their entirety on-demand or utilize the video linescore feature to view any half-inning from any game in 2008. 2008 Winter Meetings – Subscribers can access exclusive live coverage from Las Vegas, highlighted by breaking news, interviews, live press conferences and the 2008 Rule 5 Draft. Spring Training 2009 – Live video and audio broadcasts of more than 100 select 2009 Spring Training games from the Grapefruit League and the Cactus League as players prepare for Opening Day. Baseball’s Best – Unlimited access to watch baseball’s greatest games and performances from the Emmy Award nominated Baseball’s Best Moments series through the end of Spring Training 2009. MLB.com shop discount – Receive a 10% discount off the next purchase from the MLB.com shop. Offer expires on April 8, 2009. This is a good way to stir interest to baseball during off-season. For me, I’m 100% focused on football during winter.